Despite the bleak weather August had to offer, Venerdi gave us a kind welcome. Boasting a stunning serene atmosphere with perfect lighting and superbly accomodating staff. With windows taking up two whole walls of the restaurant, an open plan kitchen and dimly lit dainty circular lightbulbs, Venerdi reaches the optimal level of intimacy. For drinks, with lots of help from Mike the Barman, I opted for the Sparkling Rose Frizzante which had the perfect amount of sweetness and a light fizz. Once we’d finished our first glasses, we scanned the menu to find a suitable Wine to accompany our meal. Mike returned with two samples of red wine, he even brought some sparkling water and instructed us how to properly taste the wine! The Merlot was tasty and with lovely earthy flavours emerging. 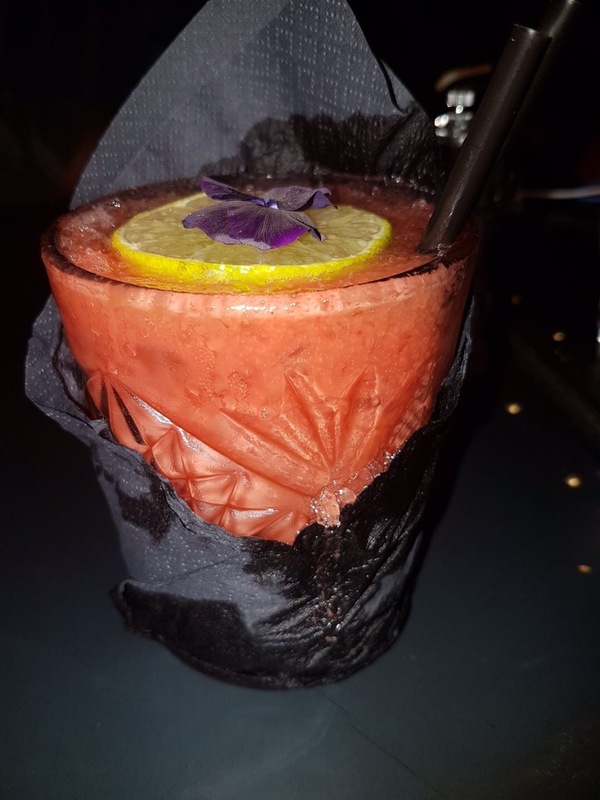 After another glass of wine I opted for a strawberry daiquiri, my all time favourite cocktail and it did not disappoint! Now i do love a sweet cocktail and having worked in a cocktail bar before I know a good Daiquiri when I taste one! Onto our starters! We opted for the Mixed Tagliere (Cured meats) and Risotto balls otherwise known as Arancini. The risotto balls were very generous portions, in breadcrumbs with and once cut into, just the right amount of melted mozzarella seeped out. Yum! The Mixed Tagliere contained cheeses, olives and sundried tomatoes and all complimented the four varieties of cured meats! I wanted to make room for my mains but it was too appealing to leave! Of course we cleared off both portions. 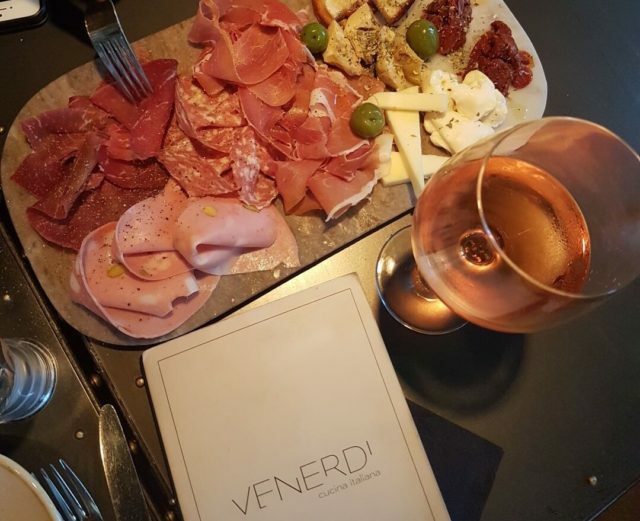 Venerdi offer plenty on the menu, from various Pasta and Pizza dishes, to lots of Duck, Chicken and Steaks! Vegetarians have lots of options too such and I had my eye on the Trilogy Pasta (Ravioli, Gnochhi and Pappardelle!) In the end I chose the Pollo Alla Milanese, Sauteed chicken in breadcrumbs, with spaghetti in a tomato garlic and basil sauce! The portions were HUGE. I expected the pasta to be quite bland as the chicken was so large but no- wrong again! It had a concoction of flavours and just the right amount of sauce! My companion went for the Rib-Eye and I must admit I was slightly jealous. It looked tender and the peppercorn sauce was generously thick and creamy. It covered the whole steak unlike some restaurants who offer a measly pot of sauce on the side! Venerdi is certainly not afraid to go all out! Now we had to have a little break before ordering dessert as we were so full! In the meantime we chilled out and enjoyed the tranquil environment- and a few more cocktails! The restaurant was busy but it was still quiet- who wants to dine in shouty canteen anyway! When dessert came our bellys grumbled away. No more they begged- but we could not resist. It looked DIVINE. The presentation was impeccible, with edible flowers and decorative sauces – perfect! We tried the Bannoffee pie, Strawberry cheesecake and Chocolate melt in the middle pudding. All three of their textures’ were soft, as our forks glided through the delightful treats. The cheesecake and banoffee pie bases were perfectly set, yet crumbled pleasingly in our mouths. Alarm bells were pounding in my stomach but if anyone knows me desserts are my weakness- I refused to put that fork down. My stomach howled all the way home but I did not regret a thing! I would highly recommend Venerdi. The staff were extremely attentive throughout, always checking if the food was okay and if we required anything else. Mike was fantastic and really made us feel at ease! We also met the restaurant owner Lorenzo who was lovely and really cared about his customer’s experience. 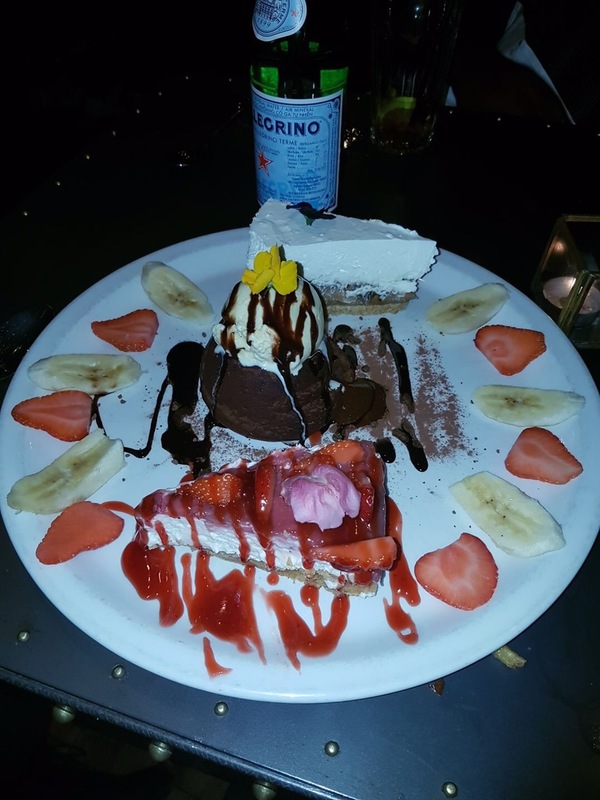 My favourite part of the meal had to be the Strawberry Cheesecake so you must give it a try! On my return I will definitely be trying the Pan Roasted Duck Breast- I saw a few people had ordered this and it looked delightful! 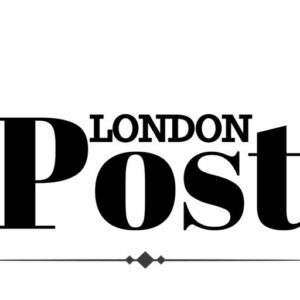 Caridon Property scores an award nomination hat trick!